Patterned sentences are great for emergent readers and writers! 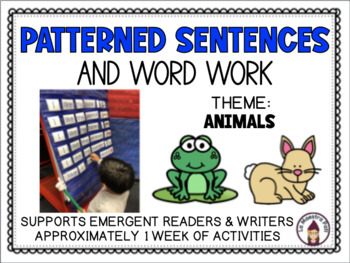 There are many important foundational skills that can be developed by studying patterned sentences. This resource is meant to be spaced throughout an entire week. There are a variety of activities to meet your students’ needs. The intent of this resource is for you to choose what works best for your students. 1. 6 patterned sentences sized for a pocket chart. There is one sentence per page. The words can be cut up so that students can rearrange the words into the correct order. Concepts of print can also be studied. There is a COLOR and BLACK AND WHITE version included. 3. 6 patterned sentences on one page. This page can be used with dabbers/coloring. Students dab each word and count the numbers of words in the sentence. 4. Writing: Students can write one sentence using a sentence frame and word bank. 10. Mixed-up sentences (4 sentences per page to unscramble with space to draw a picture).